The Compliance & Risk market in Ireland has remained buoyant throughout 2017 and into the first quarter of this year, with the high recruitment levels experienced over the past two years continuing. In the Compliance arena, there has been a particular demand for professionals with experience in Financial Crime, MiFID, AIFMD and Data Protection. In the area of Risk, we saw a spike in demand for expertise relating to Operational Risk, Enterprise Risk, Conduct Risk and Credit Risk. It has also been evident over the past year that many larger firms are continuing to recruit specialists, while smaller firms are seeking to recruit generalist second line practitioners. The popularity of both temporary and contract recruitment has also increased with many firms appointing temporary resources for particular projects, most notably MiFID II, 4th MLD and GDPR. From a regulatory perspective, Brexit-related contingency planning has been the main reason why the permanent and temporary market has increased in 2017. This year has also seen the emergence of the casually coined “one and a half line” role. Due to the growing level of regulatory requirements currently being introduced and the increasing level of scrutiny that firms are now being subjected to from regulatory bodies, firms have continued looking for new talent to improve communication between their business and second line control functions. This will be achieved through the appointment of strategic Risk & Compliance professionals sitting in the first line of defence functions. Whilst demand for Compliance & Risk professionals continued to grow over the past year, the supply of suitably qualified candidates has kept declining. This has meant that salaries across both disciplines have kept on rising as demand for suitably qualified and experienced candidates have continued to outstrip supply. These candidates are becoming increasingly aware of their market worth, especially those whose skills are in short supply. Counter offers and candidates receiving multiple offers have continued to be a common theme throughout 2017, putting further upward pressure on salaries. We expect this trend to continue over the coming year. With demand for Compliance & Risk professionals continuing to increase, especially within Financial Services firms, the net is beginning to widen and the search is on for external candidates, like accountants and auditors, to fill some of these compliance positions (e.g. monitoring roles). Prudential Regulation is also placing increasing regulatory pressure on the Financial Services sector, with many firms looking for Qualified Accountants to hold key positions in this area. GDPR and MiFID II were hot topics throughout the year as demand for suitably experienced candidates has been soaring. Given the supply shortage, many firms have had to assess skill sets that might be transferable into these roles, with IT professionals and Lawyers being increasingly considered for Data Protection related compliance roles. Given the supply shortage in certain areas of the Compliance & Risk professions, we have seen that firms with strong, robust recruitment processes and fast decision making have been far more successful in securing the best talent on the market. 2018 is set to be a significant milestone for Financial Services firms in the regulatory sense, as GDPR, MiFID II & PSD2 will come into force, and we will see the full effect of CP86. This is likely to exert further pressure on the demand for candidates with the requisite skill sets and experience. We anticipate that firms who are more flexible in their recruitment process will be in a strong position to secure the best talent. In contrast, firms with long drawn out recruitment processes, will risk not securing their top choice of talent, as many candidates now have multiple options open to them. It has been traditionally difficult for candidates to move from certain sectors of the Financial Services industry to another. For example, compliance professionals with strong Fund Administration experience have previously found it difficult to manoeuvre into a sector such as Investment Management. Over the coming year, we expect these borders to narrow, as many firms will start looking at candidates with wider governance experience from different sectors of the Financial Services industry when they are hiring for Compliance & Risk positions. Donal is a recruitment professional with over 6 years experience across the Compliance, Risk and Finance markets. Donal currently manages the Compliance and Risk disciplines at Lincoln Recruitment Specialists. He has an in-depth understanding of the compliance and risk recruitment market with a strong network of contacts. 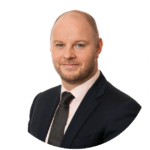 He has successfully worked with many national and multi-national companies in Ireland, who were either establishing new compliance and risk departments or expanding their in-house teams.